Tue., April 11, 2017, 7:59 p.m.
DALLAS – Gary Harris scored 20 points and the Denver Nuggets beat Dallas 109-91 on Tuesday night with the Mavericks honoring retiring Cowboys quarterback Tony Romo as a ceremonial player. With nothing at stake in a lost season that will be the worst for Dallas (32-49) since going 20-62 in 1997-98, the Mavericks followed through with an idea hatched in part by star Dirk Nowitzki weeks ago when it was clear Romo wasn’t returning to the Cowboys. Romo was honored exactly a week after announcing he was leaving football to become the No. 1 NFL analyst at CBS. The soon-to-be-37-year-old had the crowd on its feet in the final minute hoping he could play, but Romo wasn’t on the roster or under contract. As coach Rick Carlisle put his arm around Romo while the crowd roared in the final minutes, Mark Cuban pulled Romo back to the seat he had next to the Mavericks owner. The Mavericks let Romo go through shootaround and pregame warmups before introducing him with the starters, the only time he showed his white jersey with “Dallas” across the front with his football No. 9. Cuban had discussed with Commissioner Adam Silver the possibility of Romo actually playing. Instead, Dallas ended up filling an available roster spot by claiming DeAndre Liggins on waivers from Cleveland. At least a dozen of his former teammates attended, including Ezekiel Elliott, the standout rookie running back who never got to play with Romo because of the 14-year veteran’s injury. The NFL rushing leader for the NFC East champs was there in Romo’s No. 9 football jersey. So were plenty of fans. Longtime friend and tight end Jason Witten had a seat in the first half behind the Dallas bench near Cowboys coach Jason Garrett and Romo’s last offensive coordinator in Dallas, Scott Linehan. 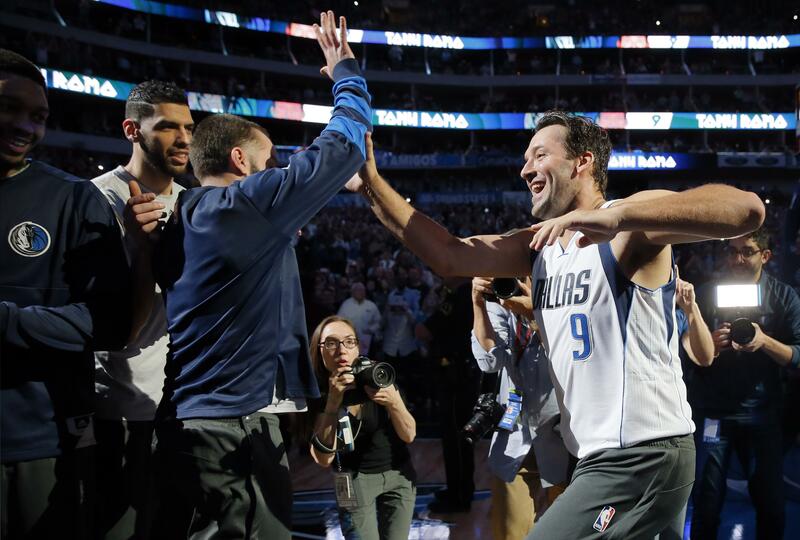 Romo said it was a “no-brainer” to accept the offer of a tribute from Nowitzki, who discussed the idea with Cuban at the party to celebrate the 19-year veteran reaching 30,000 career points last month. Cuban said if the Mavericks were eliminated from the playoffs, he would do it. On the court, Romo played with his youngest son, Rivers. A long line of media members followed Romo off the court, then filled the room where Carlisle does his game-day interviews for Romo’s only chat with reporters. Nuggets: Coach Michael Malone said four regulars wouldn’t play in the final two games: Kenneth Faried (low back pain), Jameer Nelson (right calf strain), and Danilo Gallinari and Will Barton (rest). Mavericks: Harrison Barnes and Wesley Matthews both were sidelined for rest. It’s likely several regulars will miss the finale as well. Carlisle said Liggins would play in the finale. … J.J. Barea had 13 points and nine assists. Nuggets: Finale at Oklahoma City on Wednesday. Mavericks: Finale at Memphis on Wednesday. Published: April 11, 2017, 7:59 p.m.